Somalilandsun- Kenya and Somaliland are exploring ways of working together in the education and agricultural sectors to grow their economies. The Horn of Africa nation is also keen to learn from Kenya's democratic system of governance. 'We have so much to learn from Kenya especially on governance and constitutional democracy,' Dr Shire said. 'We are happy with the success stories coming from Somaliland and we hope other regions can learn from you,' Mr Duale told Dr Shire. 'We have so many openings for Kenyan investors. We also need to look into how we can work with Kenya in the area of education. We already have Kenyans teaching in our primary and secondary schools and in our universities,' said Dr Shire. Dr Juma said Kenya remains a friend to Somaliland and will always keenly watch the country's progress. 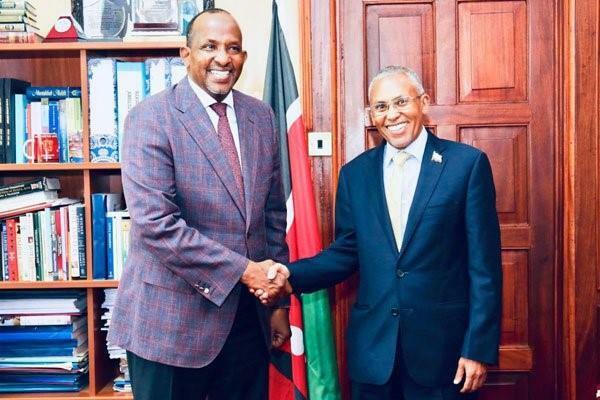 'There is so much Kenya can export to Somaliland especially agricultural products, while they can also import livestock products,' Omar said.